The greatest determinant of the success of a limited edition is the quality of the input materials used on the project. You can get better results by planning your order efficiently from the start and providing us with first-rate input materials at the outset. Artpix Studio accepts; originals, digital files or transparencies. Originals- Original artwork smaller than 12”x 17” will be scanned directly and does not require a transparency. Larger originals need to be photographed professionally to produce a high resolution digital capture, or a transparency. This can be done by your local photographer or by using Artpix Studios’ professional photo services. Of course, having the original artwork, ensures the best possible reproduction, but this choice is not always an option and is not necessary. If you do decide to send your original art, please be aware that the customer is responsible for the shipping cost to and from Artpix Studio. Digital Files- Please supply a clearly labeled CD containing your digital file. The image should be 300 DPI at the size you want your image to be. ( ex.16”x 20”@300 DPI). Very Important: How you re-size an image, for size and resolution, has everything to do with the quality of your final print. In some cases, it is better to let us re-size your image for you, this way we can be sure your digital file retains all of the resolution it originally had. Please contact cus. service for more information. Also, it is beneficial to supply us with a color visual, (laser copy, photo, matchprint etc. ), something we can use to match color. This is not a necessity, but definitely recommended. The more information sent up front, the faster/smoother the process will go. Transparencies- Transparencies come in a variety of sizes. Artpix Studio prefers the 4”x 5”size, but will accept all sizes from 35mm to 8”x 10”. Please be aware if you supply us with a 35mm or 2 1/4”x2 1/4”square, we do not recommend reproducing larger than a 14” print. If your image size is going to be larger than 14” and you only have a small slide, please contact customer service. Also, be sure to view your transparency on a light box at the photographers, or your digital file as a print out, to be sure you are satisfied with the color. Artpix Studio will be matching the color of your image to the transparency or print out you supply (unless other material is supplied also). Borders ~ Artpix Studio will center your image on the paper or canvas of your choice with a border all around. All prints will have a border. Borders usually range from a 1" to a 3" border. Mini Prints range from 1/4” to 1.75” border. The size of the border will be determined by the size of the image ordered. Max Image size depends on media chosen. Contact customer service for information. No Minimums ~ There are no minimum quantity requirements for orders. 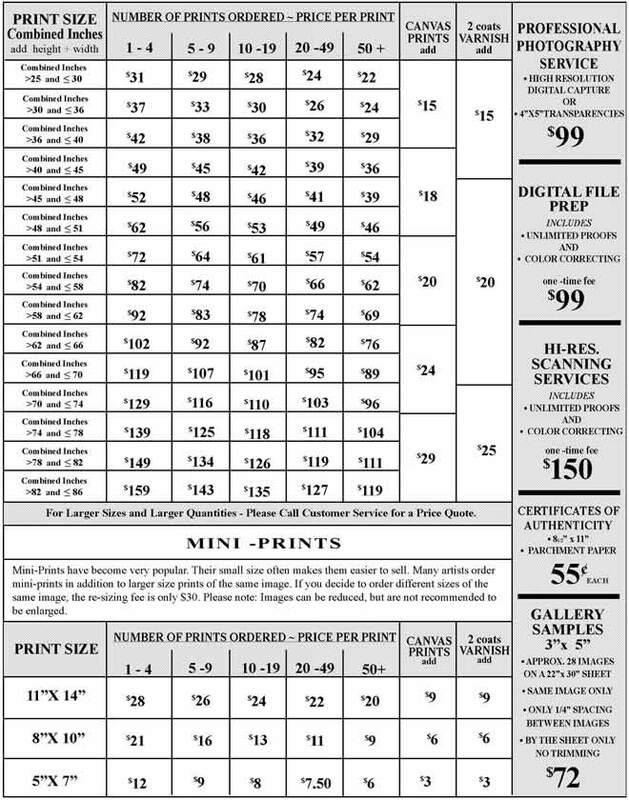 Customers can order 1, 2, 3, 4, 5 or any number of prints they need. This provides total flexibility and enables you to publish a variety of images. Keep in mind, having a number of different images for sale increases an artist or publisher’s chance for success. Proofing ~ Artpix Studio’s standard proofing policy is to send you a 9” proof for your review prior to printing your edition. The smaller proof saves customers’ money and will show the exact color on the exact paper, that the final prints will have. The proof(s) will be sent to you within 4-10 days of receiving your order (an add’l. 2-5 days if using our professional photography -Traditional-service). If a transparency provided by the customer does not accurately reflect the original, or if a digital file is of poor quality& add’l. work must be done, extra costs may be incurred. File Preperation ~ The production steps necessary to make your limited edition include: Scanning the transparency or original, implementing color refinements, cleaning any minor imperfections in the transparency/digital file, and providing you with a color proof using the same inks and paper that will be used for your full-size edition. These production steps incur a one-time charge and are not necessary when reordering additional prints. Pricing ~ To determine which price category your desired print size falls into, you must add the print’s height and width. For example, if you would like your print to be 16” x 20”, this is 36 combined inches (16 + 20). To download our order form click here. To view our order form, you will need Adobe Acrobat Reader. If required, is $25 per quarter hour. Your order is shipped 2-3 day USPS Priority Mail, unless you request expedited shipment. Artpix Studio uses a heavy weight, sturdy tube for large prints. Orders for smaller prints are shipped flat. Because we want to protect your order, every shipment is insured. For shipments outside of the United States or overnight, please call customer service at 1-631-862-2808. Please send the order, payment (in U.S. Currency) and transparencies, originals or digital files etc. of the work that you would like to reproduce to: Artpix Studio, PO Box 2190, St. James, NY 11780. Normal delivery time for orders including scanning, color work and proofing is approximately 2-3 weeks upon receiving your transparency, original or CD and an additional 2-3 days if using our photography service. If sending your order via Federal Express or UPS, please contact customer service for street address. Artpix Studio can supply your limited edition to you on a print-on-demand basis. You can keep reordering a particular print as many times as you need and as often. After 1 year - it is recommended for you to have Artpix Studio archive your image(s) -past and future- for a nominal one-time storage fee of $49. This is not a per image fee or annual fee, but a one-time fee. There is no limit on the number of images stored. Once this fee is paid, Artpix Studio will create a personal file for that client. ALL images that are submitted for reproductions in the future, will be stored in their personal file. (This file will have a double back up). Also, by paying this fee, it will guarantee that you will not have to pay for re-proofing or color changes due to decisions within Artpix Studio to change equipment, inks etc. If Artpix Studio does make changes, you will receive a color-corrected proof at no charge (at the time of your re-order). Reorders will be delivered to you in 1- 2 weeks of receiving your order. You can reorder by phone, fax, mail or E-mail. Note: Scanning, color adjustments and color proofing are not necessary when reordering. In addition, it is not necessary to resubmit transparencies or CD’s when reordering. Call us Monday through Friday 9AM to 5PM (Eastern Standard Time). Normal delivery for reorders is within 2 weeks. For faster service please have the following information ready: •Title of the image(s) •Quantity of each image •Size of each image •Credit card number and expiration date. To place a reorder, fax: 1- 631-862-2809, Monday through Sunday, 24 hours a day. Please include the shipping address, daytime phone number and an expiration date for credit card orders. Normal delivery for reorders is within 1-2 weeks of receiving your order. To place a reorder 24 hours a day, email us . Please include the shipping address, daytime phone number and an expiration date for credit card orders. Normal delivery for reorders is within 1-2 weeks of receiving your order. Artpix Studio will send you a response by email when orders are received. Our business revolves around you - the customer. We want you to be completely satisfied with our service. If you are not pleased with your final proof, we will refund the cost of your limited edition prints. However, scanning, color work and proofing are non-refundable, due to the custom work involved. If you have any questions, please give us a call and one of our representatives will be happy to help you. Call 631-862-2808 Monday through Friday 9AM to 5PM EST. For our customer’s convenience and to maximize quality, Artpix Studio offers Professional Photography Services. While we accept transparencies/Digital files, from your own local photographer without your original artwork, we encourage you to consider this service as a viable option. We appreciate the high standards and consistency of our photographer’s work and when we compare the limited edition prints directly to your original it enables us to more precisely capture the desired color. If you decide to use this service, you have a choice of having it photographed digitally or with traditional film. Digitally- You will receive a CD containing 2 files. 1 high resolution capture and 1 small jpeg (low res.) file, suitable for websites, e-mailing etc. along with your limited edition prints. Traditional film -(recommended only for over-sized editions), you will receive two 4” x 5” transparencies shot at different exposures along with your limited edition prints. If you decide to take advantage of this service, please include an additional $99. Premier Art™ Print Shield is a protective spray designed specifically for Giclée Prints. It is a lacquer-based spray with a matt finish and offers protection against UV light, water, moisture, airborne contaminants and fingerprints, while maintaining the original look. Premier Art™ Print Shield, has been tested by “Wilheim Imaging Research”, which has indicated significant increases in print permanence ratings. It is the only protective spray that Artpix Studio recommends. The cost is $24.50 a can. Presenting certificates of authenticity along with your limited edition prints assures customers of the legitimacy of their purchase and enhances the perceived value of the edition. The certificate that the artist signs, verifies that the edition size is accurate and that only the finest paper and inks were used to create the reproduction. Each certificate also contains useful information for your customers regarding proper care of their limited edition print. Certificates are 8 1/2” x 11” and are printed on quality parchment paper.